Never mind technology and fashionable trends, the old ways can still work best – and Den Reid is a master of the good old ways! Never mind casting the length of a football pitch and THEN some: he did a Mr Crabtree, stalking the banks of Dovecote peering into the margins and looking to spot the fish he was after. And the result was a magnificent 41-6 mirror! That was, in some ways, the easy bit. The tough stuff was keeping it clear of snags and getting it out. "It was just a rod-length out when it took, and from then on it was hit and hold," said GoneFishin man Den who also had two doubles in the same short session. 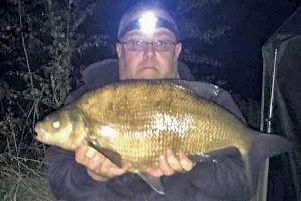 CONTINUING to haunt Bradwell, Jamie Boomer is still bagging bream, taking a good catch topped off with a 9-9 and a 9-7 while also losing what might have been a very good tench. REALLY good roach were seen in Bradwell's shallows early this week – fish estimated to around the magic 3lb mark! 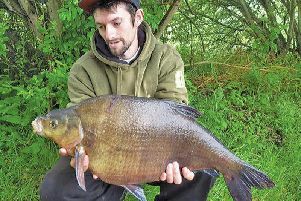 CANAL bream were feeding for MK spring league third-round winner James Drakulic (Lakes Lane Lads) as he had 26-15 from a peg near Simpson. Maver MK's Terry Lambert had 11lb, largely in the first hour, followed by Black's Matt Collerson on 9-3. Black were top on the day (two points clear of Lakes Lane) and lead the series on 98 with the Lads on 88 and Canal All-sorts on 81. A SPELL on Newport's Big Pit yielded a 22-10 common to Graham Cook, while 'Carl' had a 20 from Beacon's Mount Farm. Among those catching carp on Furzton Adam Baxter landed a 19-11 and Dylan Rynn a nice fantail. WHEN Fishing Republic's Jack Moroney and mates took Preston Farron, 11, on his first-ever fishing trip, the happy lad caught 16 rudd and skimmers from Linford's canal. MK Vets, Brackley lake: Ernie Sattler 35-7, Paul Chapman 21lb, Simon Cordingly 17-8. LINFORD club match: Ron Dorrill 8-12, Mick Hefferon 8-4, Roy Hefferon 7-10. TOWCESTER /Nene, Rothersthorpe canal: Chris Howard 2-1, Mick Goodridge 1-11, Tosh Saunders 1-9...including a 1-6 eel! TRING, Aylesbury Arm: Tim Watts 12-1, Steve Lathwell 6-9, Brian Elliott 5-5-8. FIXTURES: Saturday, Furzton A & B closed, MK individual league opener, 01234 713144. Millie Grace Memorial charity fest, Linford Lakes, June 22-24, just six places left.